Also – visit the information displays and clan tents; sign the Blenheim book; purchase souvenirs; buy food, drinks and ice creams at the Hungry Monkey food truck and the Riverstone Café coffee cart. Wheelie Bins supplied free of charge by Low Cost Bins. Suppliers: Haggis from Island Bay Butcher; Loos from Superloo Sanitation Ltd; Printing by Reiger’s. From the north – take Johnsonville Exit from SH1 Motorway; at the roundabout take the 2nd exit to Moorefield Rd; continue on Moorefield Rd to the roundabout at Haumia St, where it becomes Burma Rd and Onslow College is on your right with a clearly marked entrance. From the south – take the Johnsonville exit at the top of Ngauranga Gorge; continue along Johnsonville Rd; turn left at the lights at Broderick Rd; turn left into Moorefield St at the lights, then follow Moorefield Rd to the roundabout at Haumia St, where it becomes Burma Rd and Onslow College is on your right with a clearly marked entrance. See Onslow College on Google Maps. Bring your picnic (there will be a food truck and a coffee cart selling food, cold drinks, hot drinks and ice creams). Bring your hat and sun-screen, bring chairs if that’s going to be more comfortable for you. Drive into the College entrance and follow the signs. There will be parking marshals to assist you. If you have a mobility parking permit, you will have access to our mobility parking area on the field, but otherwise there is no parking on the playing field. It would be helpful if you could let us know in advance if you will be needing this facility – contact Hugh McPhail (see below). We will cancel only if the weather is really bad. So check the Facebook page at https://www.facebook.com/Blenheim175/, or go to the Newstalk ZB Cancellations website. There will be Portaloos available. Wheelie bins will be available for rubbish – please use them. Onslow College is a smoke-free area, please respect their rules. The picnic will be opened by Ian McKinnon. There will be a Parade of Blenheim Families, marshalled by Ian Dickson, with a Salute to the Families by Hugh McPhail. A Haggis Ceremony with the Address by Capt. Robert McMillan will be followed by an opportunity to taste the beast. While eating your picnic you can enjoy Celtic music from Elizabeth Auchinvole. We will then have demonstrations of Highland Dancing from Scot Dance; traditional Scottish Country Dancing from the Island Bay Scottish Country Dance Club; and a kilt-making demonstration from Chrissy Tetley. Rob Cameron will co-ordinate the children’s sports, with running and novelty races – spoon and tattie, three-legged and sack races, and special Scottish events like tossing the caber, sheaf toss, gumboot throw and the haggis hurl. The pipes and drums of the City of Wellington Pipe Band will perform throughout the afternoon. The Tug of War will provide an opportunity for competitive activity by young and old. We will end the organised part of the picnic with a lowering of the Scottish flag, but please stay on and enjoy the opportunity to mingle and chat. There will be displays of historical information and items, while a number of clans will be there with their clan tents. 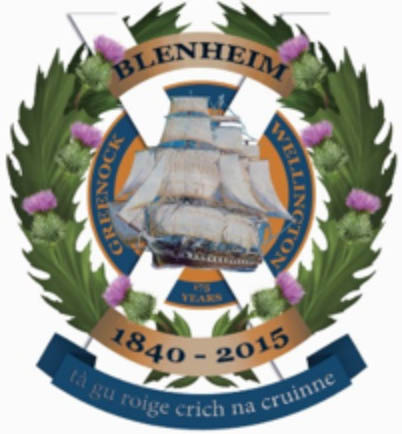 You are invited to sign the Blenheim Book to record your attendance at the 175th anniversary – this is the book that contains the signatures of those who attended the 150th anniversary event in 1990. Souvenirs will be available to purchase, as well as the book “The Blenheim People”, which brings together information about the families that travelled on the Blenheim.